IIT Madras-Indian Institute of Technology Recruitment 2018-2019 Application Form for Senior Research Fellow (SRF) Posts Download Application through Official website Interview. IIT Madras Senior Research Fellow (SRF) Jobs Notification 2018 Released. The Interested Candidates are requested to Download Application through Official website Interview. The last date for submission of applications is 02.04.2018. 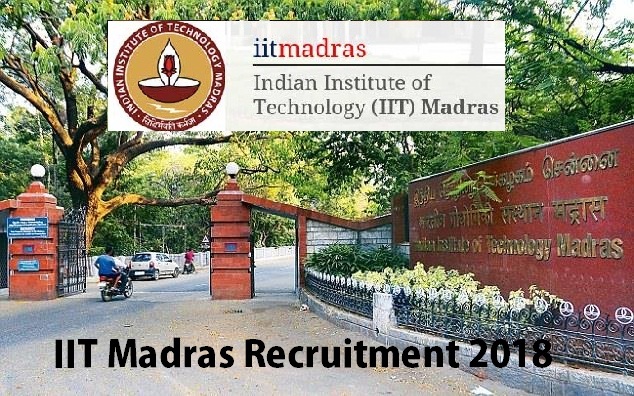 IIT Madras Career Recruitment 2018 @ Chennai - Apply Now. Salary: Rs. 28,000/- per month. Application in the form of Biodata / Resume giving name, date of birth age, address, full details ofeducational qualifications (stating the marks, ranks, year of passing), Photograph, community and experience etc. along with copies of certificates, should reach on the following address on or before 02.04.2018.